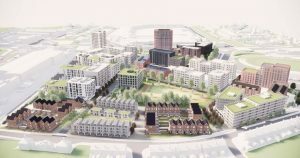 Birmingham’s preparations to host the 2022 Commonwealth Games sprinted ahead today (December 20) with the approval of the Planning Application for the residential element of the Athletes Village. The planning application approved today is for the first phase of a wider regeneration scheme for Perry Barr, which will provide around 1,400 new homes. The properties are being built on the site of the former Birmingham City University campus and will accommodate around 6,500 athletes and officials coming to Birmingham in the summer of 2022 when the Games take place. After the Games, the properties will be converted to provide around 1,400 new homes across a range of tenures – social and affordable rent, homes for sale, and for private rent – creating a new high-quality residential neighbourhood for Perry Barr. The development, unanimously approved by Birmingham City Council’s Planning Committee, will also include a retirement village and a community centre. And in recognition of the importance of the scheme as a catalyst for the wider regeneration of Perry Barr, financial support has been secured for the council-led scheme from central government (£165million) and the West Midlands Combined Authority (£20million). Work is set to begin on site in early 2019, to ensure completion in time for the arrival of representatives from the Commonwealth’s 71 nations and territories in the summer of 2022. Cllr Ian Ward, Leader of Birmingham City Council, said: “Since we announced our intention to bid for the 2022 Commonwealth Games, I’ve always said the event is about so much more than just 11 days of sport. “The regeneration of Perry Barr will be the most tangible and transformative legacy we achieve as a result of hosting the Games, bringing investment and regeneration to area that has long been crying out for it. Cllr Sharon Thompson, Cabinet Member for Homes and Neighbourhoods, added: “Through this scheme we will provide people from across the Commonwealth sports movement a first-class home away from home when they come here for Birmingham 2022. Future phases of the Perry Barr regeneration plan will be consulted on in 2019.